If you are a computer techniciain or work in electronic component manufacturing, in a hospital or clean room, Static Dissipative (SD) shoes are recommended. Static electricity can be dangerous in these environments. It can damage the electronic chips that you're assembling or the equipment that you use to build the components. Static dissipative shoes are built in a way to help prevent sparks of static electricity from causing damage. Static electricity refers to the electrical charge that exists on surfaces, including floors. Whenever two surfaces – such as the sole of your shoes and the floor – come into contact with one another and then separate from one another, an electrical discharge can take place. You probably remember as a kid purposly scuffing your feet on the carpet and then touching someone and getting a shock. It was caused by the static charge build-up on your body and was probably pretty funny at the time. In a sensitive work environment, this charge can be dangerous. The only way to prevent this is to ensure that the surfaces - the floor and your footwear - are allowing the electricity to flow through. If the electricity continues to flow, it will dramatically reduce a charge build-up and thus reduce the risk of shock and sparks. HOW DO STATIC DISSIPATIVE SHOES HELP YOU? When you wear footwear with static dissipative qualities any electric charge can flow between you and the ground whenever your shoes come in contact with and then separate from the floor - it does not build up on your body. 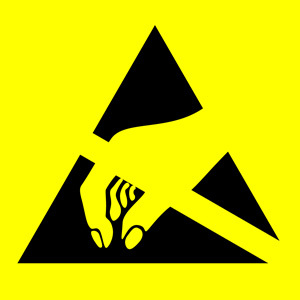 This reduces the chance of a static shock discharge when touching metal or sensitive electronic equipment. In the United States, SD shoes must meet ASTM F2413 standards by reducing the accumulation of static electricity while maintaining a level of electrical resistance between 106 ohms and 108 ohms. In Canada the CSA standard says the electrical resistance shall fall within a range of 106 ohms and 108 ohms for a period of 5 seconds when tested in water. SD footwear should be worn in clean environments only. It is recommended that they be worn in conjunction with static dissipative flooring. Note: If you're an Electrician, Lineman or work with electrical conductors you will not want SD footwear but rather Electrical Hazard (EH) boots or shoes that will help to insulate you from the ground. Electrical Hazard boots will reduce the flow of electricity through the shoe when exposed to open circuits of 600 volts or less in dry conditions and protect you from electric shock and electrocution. Lehigh CustomFit has a expansive collection of SD footwear for men and women in a range of styles. If you have any questions about whether you should wear SD footwear in your work environment, feel free to CONTACT US and we'll help you determine the best pair of safety footwear for your job.